Happy Monday! We hope you guys had a great long weekend! 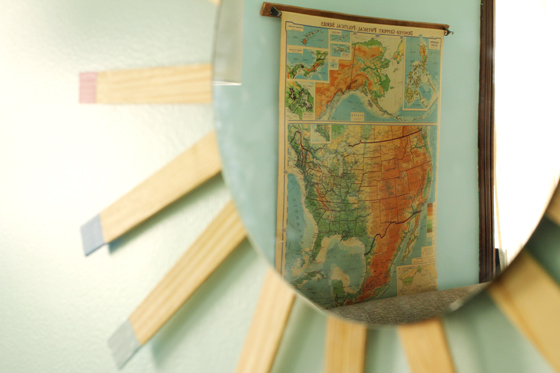 We’re excited to have a new DIY project to share with you today that I’m pretty excited about. It’s been a long time in the making… over two years, actually! 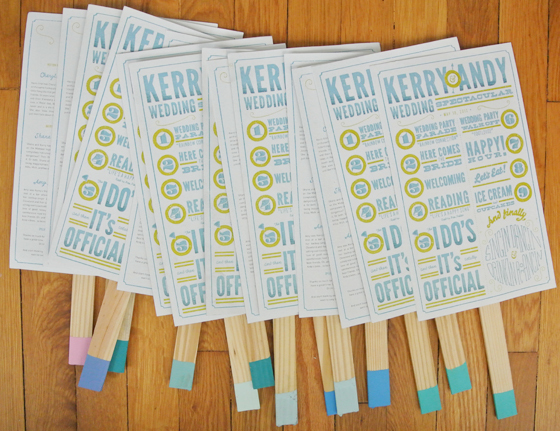 One of the most fun DIY projects Andy and I put together for our wedding two years ago was our ceremony programs. We had the idea to attach our programs to paint sticks that we dipped in lots of different colors of paint — all samples of colors that we had bought for rooms in our house. I mean, you know how often we paint around here, so this was the perfect wedding program and DIY project for us. 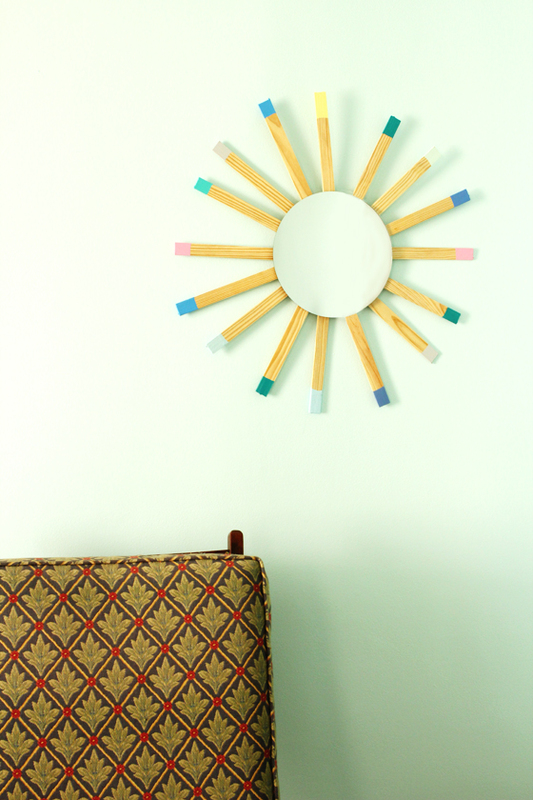 After spending all that time dipping the paint sticks, we definitely didn’t want to just throw them away! 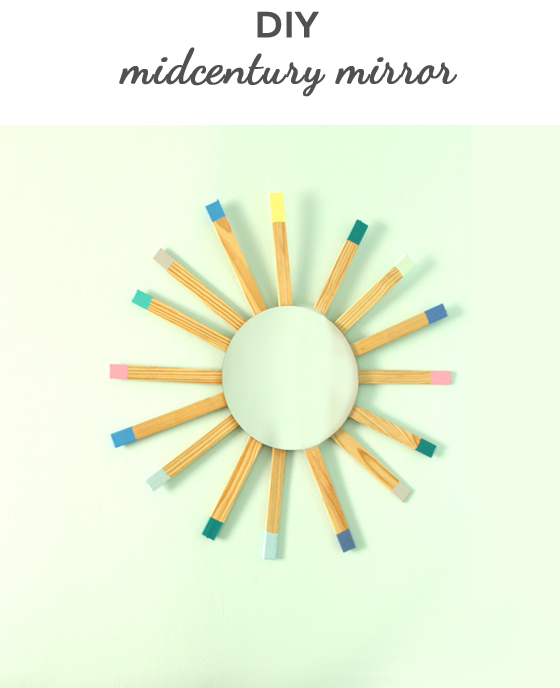 They’ve been sitting in a box in the attic since the wedding, and I finally decided they would look really cute as a midcentury-inspired sunburst mirror. It only took about two years to actually get around to doing it! Ok, I’m really not reinventing the wheel here. This is a project that has been done a lot of different ways before, but I think it’s just so cute and completely perfect for our updated rumpus room. Here’s how I made ours. 1. I selected a random collection of our painted sticks, so I’d have a variety of colors to choose from. I figured using a bunch of colors instead of sticking to one or two leaves us open to incorporating more colors into the room down the road. Plus it’s just more fun that way! 2. After I pulled the paper off the sticks and washed off the old glue residue, I cut a piece of stiff cardboard just smaller than the mirror. 3. 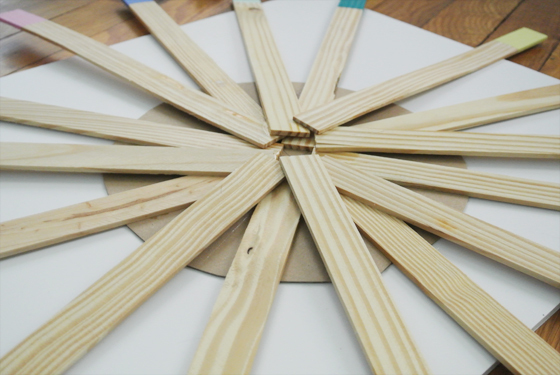 I found the center of the cardboard circle and rearranged the sticks until I decided on a layout I liked, trying to keep the lines straight and the whole thing well-balanced. I started out thinking I wanted to use a lot more sticks but ultimately preferred a more minimal look. 4. I glued the sticks directly to the cardboard. 5. I then put a bunch of books on top and let it sit overnight to make sure it was really, really stuck. 6. I finished by gluing the back of the mirror to the front of the cardboard, again stacking books on top for a few hours to let the glue dry. To hang the mirror on the wall, I attached a couple of velcro Command strips directly to the back of the sticks and then attached it to the wall. 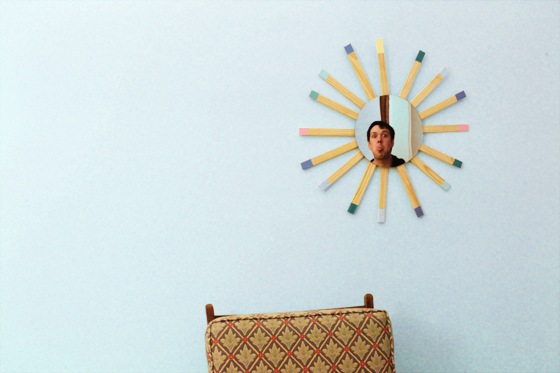 The mirror isn’t very heavy, and it seems to be stuck to the wall quite well. This project was super easy peasy and looks really great on the wall. It adds a fun pop of color and is a great shape in our updated rumpus room. Plus it fits perfectly in the empty wall space where our piano used to be. So now we only have about 120 more paint sticks to use. Hmm… we’re open to your ideas! P.S. The walls in this room are blue, not green. They change a lot with different lighting conditions and our cameras have a hard time picking up the right color. See this post for an accurate color, if you’re curious.